Today IMAX has released a new Behind The Frame featurette featuring Fantastic Beasts: The Crimes of Grindelwald director David Yates, producer David Hayman, Eddie Redmayne and Jude Law discussing why IMAX is the ideal format for bringing the Wizarding World to life. From the biggest screens to heart-pounding audio and an awe-inspiring picture, it is more fantastic in IMAX! The IMAX release of Fantastic Beasts: The Crimes of Grindelwald will be digitally re-mastered into the image and sound quality of The IMAX Experience® with proprietary IMAX DMR® (Digital Re-mastering) technology. The crystal-clear images, coupled with IMAX’s customized theatre geometry and powerful digital audio, create a unique environment that will make audiences feel as if they are in the Wizarding World themselves. Watch the featurette below and make sure you get your tickets for Fantastic Beasts: The Crimes of Grindelwald, out November 16th! Fantastic Beasts: The Crimes of Grindelwald Cast Visit Parkside School! The cast of Fantastic Beasts: The Crimes of Grindelwald spent the day on Thursday, November 1st celebrating the Wizarding World with students and community from Parkside School in Baileyton, Alabama. Eddie Redmayne, Jude Law, Ezra Miller, Zoe Kravitz and Callum Turner surprised the students for a day of games and fun! Make sure you get your tickets for Fantastic Beasts: The Crimes of Grindelwald, out November 16th! The principal, teachers, staff and alumni at Parkside, a title one school in Cullman County, Alabama, transformed classrooms and hallways into the Hogwarts Houses seen in the Harry Potter series, using their own money, raised funds and donated materials to inspire as well as educate their students, and to provide a safe and creative environment for them to grow and learn. To honor and celebrate these educators and their dedication to their students, the cast of Fantastic Beasts: The Crimes of Grindelwald surprised the students and faculty as the school hosted Wizarding World Day full of themed games and lots of excitement. Fantastic Beasts: The Crimes of Grindelwald will be released on November 16, 2018, the film will be distributed worldwide in 2D and 3D in select theatres and IMAX by Warner Bros. Pictures. Nine new posters for Fantastic Beasts: The Crimes of Grindelwald have been released featuring character shots and taglines for the films major players. We see Newt Scamander, Albus Dumbledore, Gellert Grindelwald, Jacob, Credence, Leta, Theseus, Queenie and Tina Goldstein. Each poster contains a tagline pertaining to that characters wearabouts or role in the film. All nine Fantastic Beasts: The Crimes of Grindelwald posters can be viewed in the gallery! Fantastic Beasts: The Crimes of Grindelwald hits theaters on November 16, 2018. This morning, Wizarding World fans at King’s Cross railway station for “Back to Hogwarts” Day got the surprise of their lives when Eddie Redmayne and Jude Law, stars of the highly anticipated new big-screen adventure Fantastic Beasts: The Crimes of Grindelwald, apparated on Platform 9 ¾ to join the festivities and lead the countdown to the 11:00 AM departure of the Hogwarts Express. The annual gathering is a big moment for the U.K.’s massive population of Harry Potter fans. Each year on September 1st, they flock to King’s Cross by the thousands, often dressed as their favorite character from J.K. Rowling’s Wizarding World, to commemorate the day young wizards and witches from across the U.K. make their way to Platform 9 ¾ to board the iconic steamer that whisks them off to attend Hogwarts School of Witchcraft and Wizardry. Fans lined up for hours at a popular photo point to get a shot of themselves pushing a luggage trolley “through” the brick wall to recreate Harry and others’ passage through the magical barrier and onto Platform 9 ¾, with staff on-hand to help with the finishing touches, such as their Hogwarts scarf. But in the place of staff members, fans reached the front of the line to find none other than Redmayne and Law standing by to assist. Following a lively round of photos, the two stars led the countdown to the 11:00 AM departure of the Hogwarts Express. 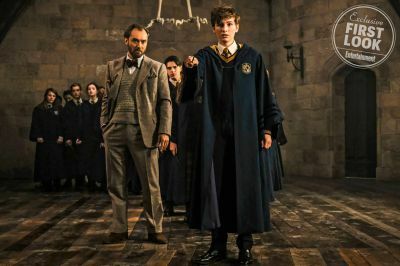 In the new film, Redmayne once again stars as Magizoologist Newt Scamander, with Law taking on the iconic role of Newt’s friend and one-time professor, Albus Dumbledore, decades before he becomes Headmaster at Hogwarts. Fans can look forward to experiencing Hogwarts again when Fantastic Beasts: The Crimes of Grindelwald, the second of five all new adventures in the Wizarding World, comes to cinemas on 16 November, 2018, from Warner Bros. Pictures. 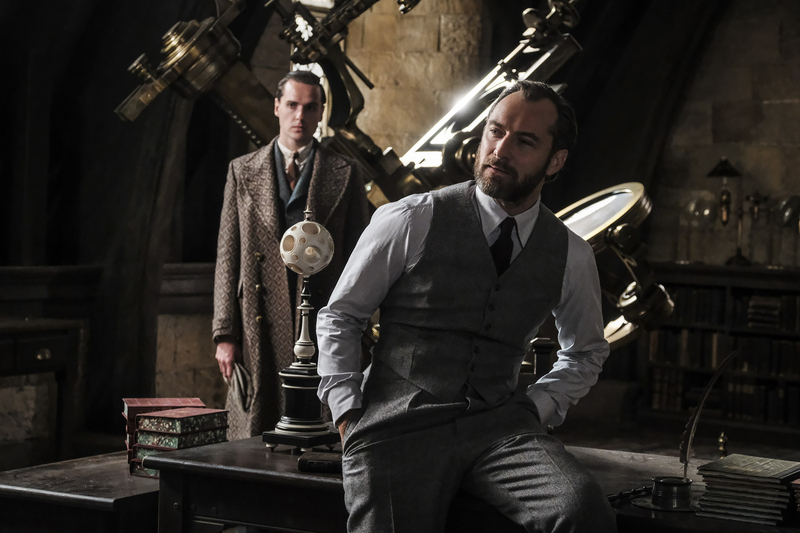 In a new interview with EW, Jude Law discusses playing Young Dumbledore in Fantastic Beasts: The Crimes of Grindelwald. In what will come as quite a shock to book fans, Jude says Dumbeldore is not transfiguration teacher (at this time.) Perhaps J.K. Rowling forgot to mention his stint as Defense Against the Dark Arts teacher in all her past interviews about Dumbledore. Only time, and seeing the film in November, will tell. So what’s Dumbledore like at this age and how different is he than how we know him? As I mentioned before, there’s a sense of humor and mischief, a dash of anarchy, a sense of what’s right and what he believes in, and a sense of mystery. There’s also how he comes around to get people onto his way of thinking — which is rather indirectly. He also has a certain heaviness about him that I don’t want to reveal too much about — and that’s something he has to overcome, or hopes to overcome. He’s also got a great passion for sharing his knowledge, he’s a powerful and inclusive teacher. So he teaches Transfiguration, right? He doesn’t teach Transfiguration, actually, not at this stage. There was some uproar earlier this year when director David Yates told EW the character not “explicitly gay” in this film. What’s your take on how apparent Dumbledore’s sexuality should be? Obviously, Dumbledore had a relationship with Grindelwald. What’s that relationship like at this point in time? And what was it like working with Johnny Depp? Read the full interview for more! Entertainment Weekly and Empire Magazine have released new photos from Fantastic Beasts: The Crimes of Grindelwald! 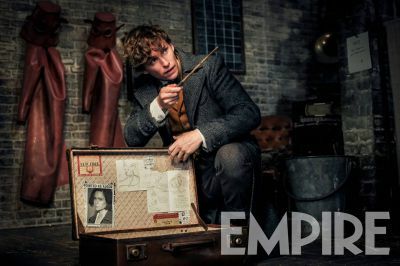 The first shows a photo of Newt with his luggage open pointing his wand at something. The second shows Dumbledore teaching students about boggarts, including a young Newt Scamander! Both images can be seen in high resolution in the gallery! Fantastic Beasts: The Crimes of Grindelwald hits theaters on November 16th.